EnduranceEurope Bulletins: What the crew thinks of the richest ever endurance ride. What the crew thinks of the richest ever endurance ride. The Sheik Mohammed bin Rashid Al Maktoum Endurance Cup is being hailed as the greatest endurance ride in the history of the sport after the world record breaking victory by UAE rider Omair Hussain Al Beloushi on a 10 year old Arab gelding Charlandre El Sharif. That all fine, but what is it like to CREW in the most prestigious ride ever? I've been crewing at international rides for over 12 years - from European Championships to "ordinary" FEI 3 stars; but always in Europe. This was my first trip to the UAE. From the moment I arrived here I realised that this is an incredible place. I landed at 1.00am local time. The airport was packed with people, the roads were crammed with traffic and the building sites - the seemingly endless building sites - were all working flat out. Next morning I was up early to greet Khadidja du Pont (our 10 year old Arab mare) as she arrived at the quarantine stables after her 19 hours trip from our home in England's Cotswolds. I continue to be amazed. The stables are of course air conditioned, the vets are on hand to take bloods and do free post-travel analysis for us if we wish (which of course we do) and there is an impressive system in place - backed up by lots of people - to not only enforce the quarantine regime but also to meet all our requests for feed, hay, bedding, buckets, and information. In all we have 27 European horses stabled in 3 barns inside our quarantine compound with a clearly marked 19km quarantine exercise circuit for us to walk and ride our horses. And all of this just minutes away from the jaw-droppingly awesome venue - Dubai Endurance City. I took a trip to DEC a few days before the ride - an army of gardeners were watering the grass and clipping the hedges. The place is amazing. The other thing that hits you is the profile of endurance out here. I blagged my way into the launch press conference in a downtown Dubai hotel - another well organised highly professional event -with lots of media present. Gulf news the leading English language paper in the region is full of our sport, you'll be familiar with that from seeing their articles on endurance.net. But that's just the tip of the iceberg - the local Arabic language media are just as interested in endurance. Most days I saw journalist and TV crews around the exercise circuit looking for European riders they recognised to interview. I tried hard to look like an important rider. I guess there is something about me that says "He's only the crew". If we are lucky enough to get an invite again I'll have a T shirt with "I'm also an Advance Level rider" written on it (perhaps in French). 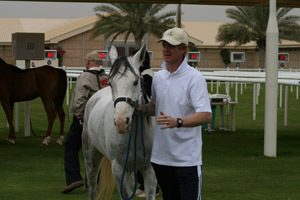 And then, after a few days rest for the horse and a few days riding, my wife arrives and we prepare for the off. Just when I thought I'd got used to Dubai, race day is upon us. And then there is the vet gate itself. Dubai Endurance City looks even more incredible bathed in powerful floodlights. Big screen coverage on site; 7 different restaurants all alive at 6.00am (heaven help the crew who sneaks off for breakfast right now); you can't help but get nervous. We watched - his horse was as bright as a button at the end. But let me tell you about crewing this ride. In some ways crewing here seems easy - nearly all of the ride is accessible to 4x4 vehicles. You can literally drive alongside the course - hence the movie footage you can see. And this is made easier still by the marking - lots of flags, regularly placed and although many of the stages have common elements there are teams out all day taking away coloured flags from loops now completed to minimize scope for confusion. But in other ways crewing is difficult. Firstly, there is a great deal of deep, deep sand to navigate - far more than the riders and horses have to contends with because (rightly) they get the best surface and the crews take whatever is alongside. Skillful experienced desert drivers can cope with this without getting stuck, those with less desert experienced or who are just bad drivers can only get through it if they drive at speed. You will be amazed how many Arabs join folk like me in the second category. Secondly there is a huge amount of traffic - especially on the first loop - and no rules of the road (because there is no road?) The organisers provided free 4x4 convoys for spectators; the nearby Bab Al Shams Desert Hotel did the same for their guests - and this was designed to REDUCE the number of vehicles following the riders!! As you can imagine at the start traffic congestion is at its worst. When we set off into the jet black of the pre-dawn desert at the beginning of the first 32km stage it was like being in the whacky races. All around us hundreds (literally hundreds) of 4x4 vehicles of every shape and make - including ambulances, police and TV crews. They all flashed through the desert, each one carving out its own route and seemingly oblivious to everyone else. Every vehicle had two objectives: to follow the ride (and in the case of the crews their horse), and not to get stuck in the deep sand. As we dodged our way through the cars that had already got stuck it became increasingly difficult to maintain momentum without crashing into someone. Eventually our luck ran out, as I swerved to avoid the suddenly stationary car in front the nose of our car dropped down into a deep trough and we were stuck. Buried up to our front axles we had no hope of freeing our crew vehicle. It was less than 20 minutes into the race, we hadn't seen our rider and we couldn't move. All around us others were in the same predicament. We saw 2 police vehicle and an ambulance nearby - helpless in the sand. We watched in desperation as the Dubai Equestrian Club's own tow truck slowly worked its way up the hill pulling out one car after another. By the time they pulled us out it was light and we were worried that we wouldn't get back to the vet gate before the horse. We drove back to DEC arriving just in time to get organised before Janice and Khadidja came in to VG1. From that point on we left a crew member behind at the venue to ensure we would have some Vet Gate support if the worst happened. Daylight, the spreading out of the field and the VG1 eliminations greatly reduced the congestion on the track. From that point on, although we had some scary moment, we didn't get stuck again. Many other crews did and it remained a real concerned right through to the end of the last loop. The business of crewing from the start of the second loop was almost ordinary. We had picked up some bottled mineral water (provided free at the start) to use on the run and we made full use of the water stations - located 2 or 3 times each loop and offering a row of big drinking troughs constantly replenished by the organizers. These troughs gave us an opportunity to refill some bottles and to scoop water over the horse. We were blessed with cool temperatures all day, so dehydration never became an issue for us. Again thanks to conditions very similar to our summer back home the vet gate procedures ran smoothly for us. Khadidja du Pont presented to the vet in under 4 minutes (average across the day) and we were being conservative. She breezed through the vettings and the 3 compulsory re-exams. During the holds (30 and 40 minutes) we usually needed to put a rug on her to keep her warm. We used Equi-N-Ice coolant to chill leg bandages too - a big help as much of the course was very concussive. There was just one other issue for us - fuel consumption. The high revving and hard driving to get through the deep sand pushed fuel consumption through the roof and my hired 4x4 ( a small Mitsubishi Outlander) simply didn't have a big enough tank. Before half way I realized that I was going to use MORE than a tank of petrol (another weakness: because the stuff is so cheap out here most vehicles are petrol doing less miles per gallon that the diesels we have back home). At one Vet Gate as soon as the horse passed the vet I had to leave my wife and two fellow crew to manage the hold time and re-exam so that I could get fuel. Because DEC is in the middle of nowhere that was a 60km round trip. By the time I got back Janice and Khadidja where out on the 5th stage. I caught up with her as soon as I could, but it did cost us a little as the horse was not as wet as I would have liked leaving the vet gate and I'd missed some early opportunities to crew on the course. At this stage I think it would have been really helpful for psychological reasons as the two were all alone. There pace slipped a little on this circuit and I blame myself for that. However normal service had been resumed and one more vet gate, one last loop and about 10km of that in the dark and we were home. The last stage was better - both the rider and horse knew they were on the way home and picked up the pace again even though they didn't see another horse. Janice was the first British rider to cross the line finishing in 23rd place, the 4th European combination to finish. Not bad for our first trip to the desert.